Inquiries with both member states and security officials confirm the find of "forty pounds of pure cocaine... through the scanner" -- the scanner which security sources say is located in the UN's still open third sub basement. Whistleblowing sources complain that while international drug trafficking is (at least) a Federal crime, only the NY Police Department was called, apparently with little follow-through so far. "Why didn't they let the pouch be picked up and see where it would lead?" this whistleblower asked Inner City Press. After the "suspicious package" was found, select UN Security personnel were convened and cursorily told that it had been turned over "to the host country." 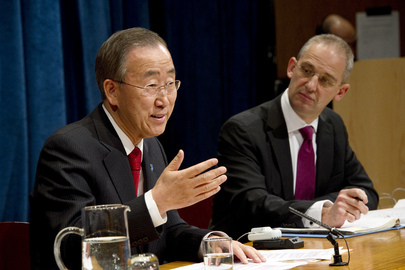 Secretary General Ban Ki-moon alienated many within UN Security when, after security officers were injured by the bodyguards of Turkey's prime minister Erogan in September 2011, as Inner City Press exclusively reported Ban immediately went and apologized to Erdogan. "Now this," one source told Inner City Press. Another source asked, under Ban, "what is ID/OIOS" -- the Investigations division of the Office of Internal Oversight Services, from which Ban removed his critic Inga Britt Ahlenius - "doing about drug trafficking in the UN?" Watch this site. Background: when Inner City Press previously exposed the dispensation of narcotics by UN "doctors" who were not licensed in New York, the UN's response was to claim that the report violated privacy, and to demand that evidence be withdrawn. Now, on the cocaine, Inner City Press' whistleblowing sources want to know: where has the evidence gone, and where is the follow up, in Ban Ki-moon's purportedly reformed or reforming UN? But if it was inside the UN, how is it not connected to the UN? Inner City Press has gotten off the cuff, and requested formal, comment from the US Mission to the UN - watch this site.